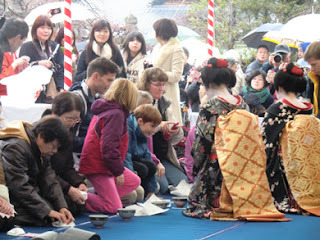 Geiko is busy treating the guests. 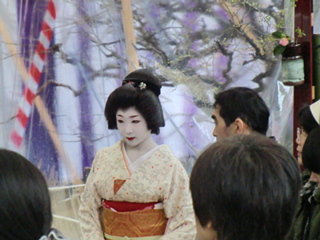 or, at the Japanese-style room (like this photo). 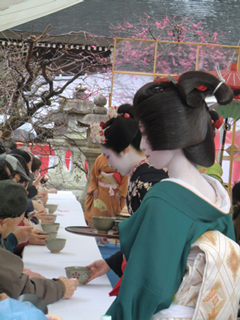 I recommend having a tea at the Japanese-style room. 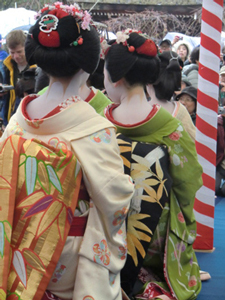 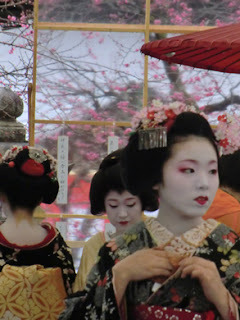 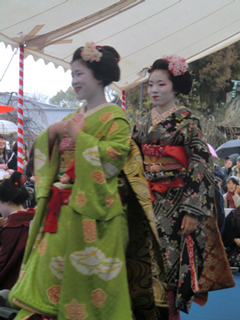 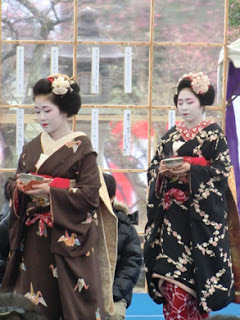 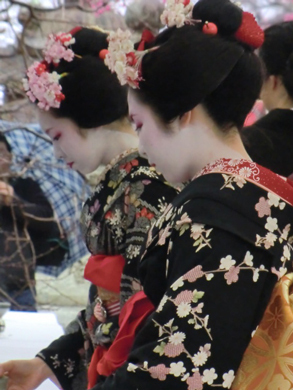 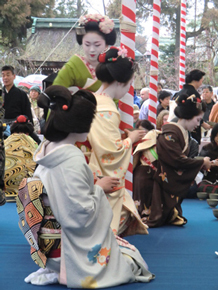 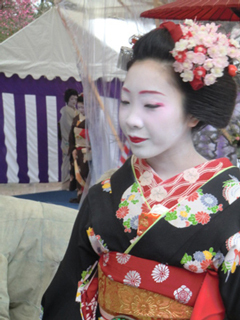 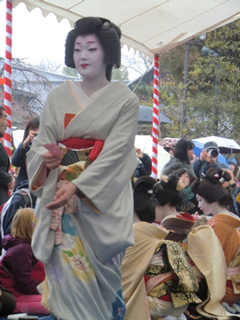 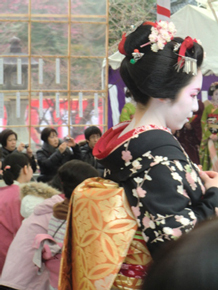 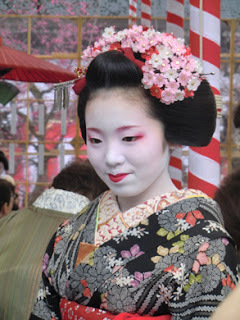 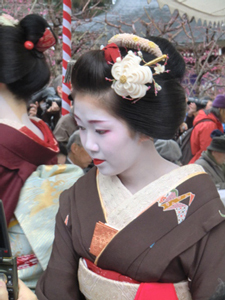 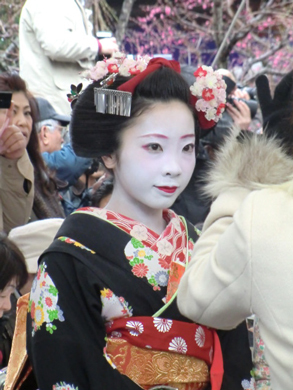 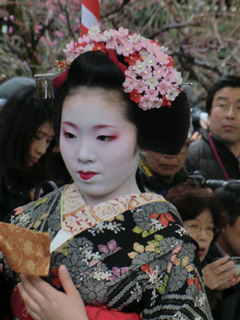 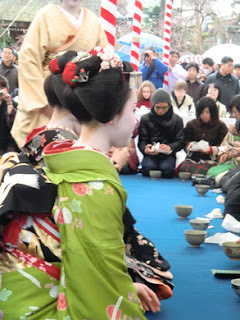 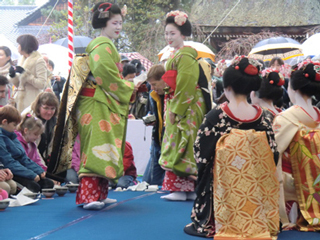 First,it shorten the distance between maiko and guests. 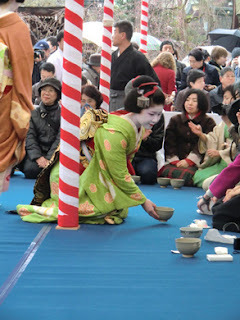 Secondly,Japanese tea ceremony should be performed gracefully with the traditional ritual,I think. 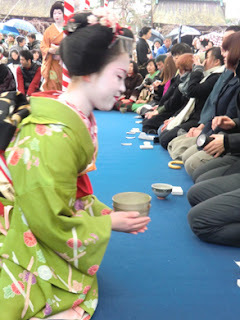 Table is kind of western-like,I think. 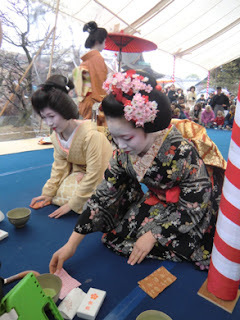 They're preparing teas for guests. 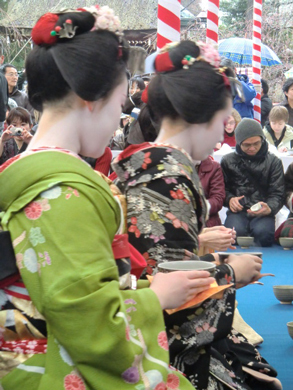 Hope you enjoy Japanese spring tea ceremony with us. The pink plum blossoms are at their best now. 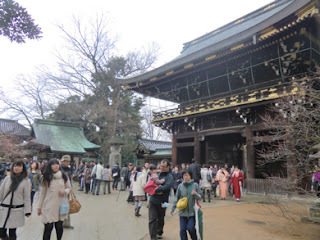 This is Kitano-Tenman-Guu Shrine in Kyoto. 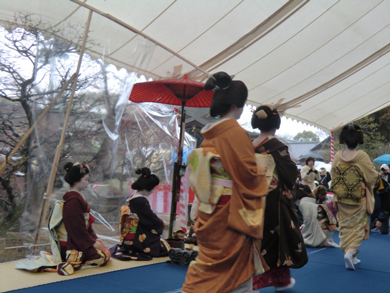 Today we have tea ceremony in the garden of this shrine. 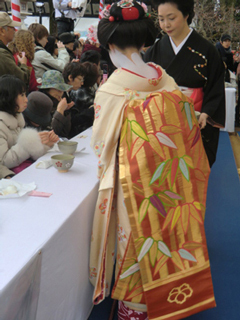 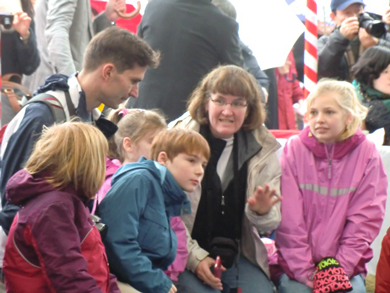 This ceremony is held annually on February 25. 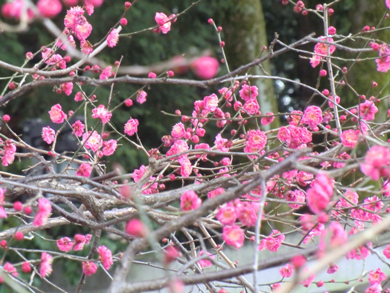 Municipal bus(No.50 or 101) is good from JR Kyoto station,and get off at Kitano-Hakubaichou. 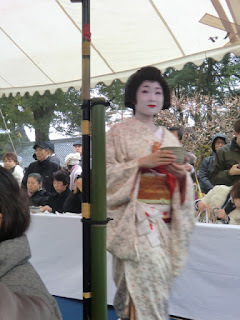 Early morning is good,(9:00a.m) because there are so many people waiting for their turn. 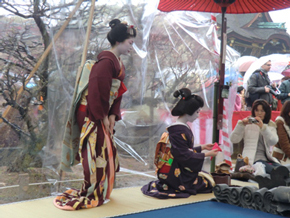 This is the tea ceremony place. 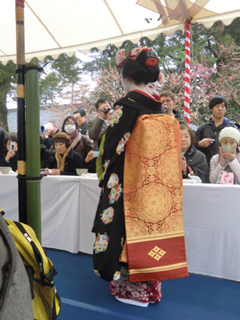 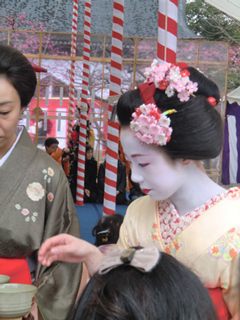 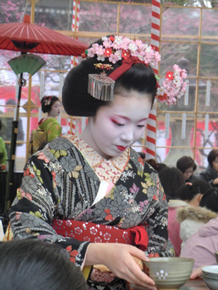 Everyone is waiting eagerly to be served maccha tea by maiko girls. There are many tourist from abroad here today. 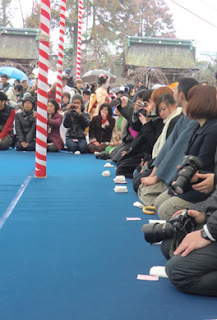 This must be exciting moment for them. 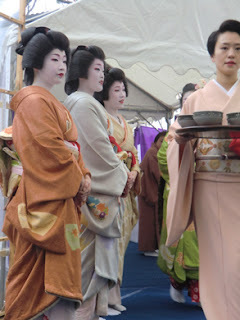 Finally these women started to serve teas for guests. 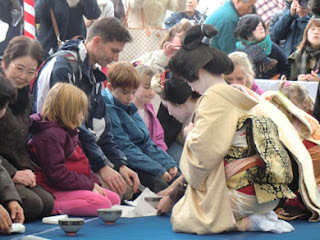 Geiko and maiko serve teas one after another. Finally maccha teas are served to this family. 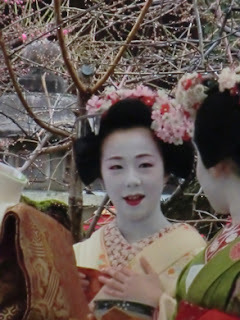 This cute girl looks nervous now. 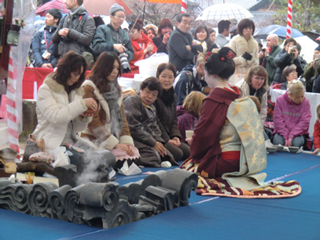 They're having a pleasant chat with guests. 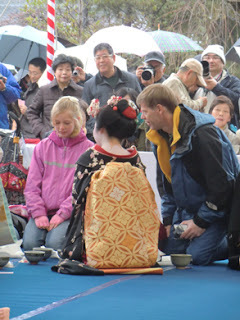 ﻿ ﻿﻿Maiko receives today's ticket from guests. She serves the teas with graceful movement. because the size of these photos were too big,too heavy.